Please see a continuation of my top 10 weight exercises: where I give my opinion on some of my favourite exercises that have been a staple of my gym routine for many years. I have a very traditional and basic attitude to weight training – you won’t see gimmicky exercises or “Wolverine Workouts” here. If you have experience of weight training you have probably heard of most of my list. I take the view to be the master of these 10 weight exercises, rather than do a new routine everyweek. They say that the bench press is the ultimate show of strength. I disagree! After all I think it is more impressive to be able to say that you can lift 50% all the way to 100% (or more) of your body weight above your head! 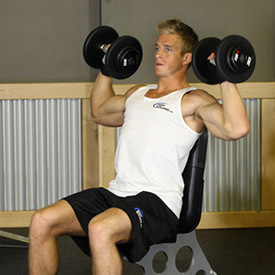 With a pushing movement you work your shoulders and as a second benefit the triceps get a bit of extra love. The image above shows the fitness model sat down to do this movement, if you do it this way you will have more focus on using your shoulders and arms to lift the weight, rather than the use of your whole body. I only would do it this way if I had problems standing for any reason. Because there is less reliance on the back you will probably find you need to lower the weight as you don’t have the rest of the body supporting the movement. 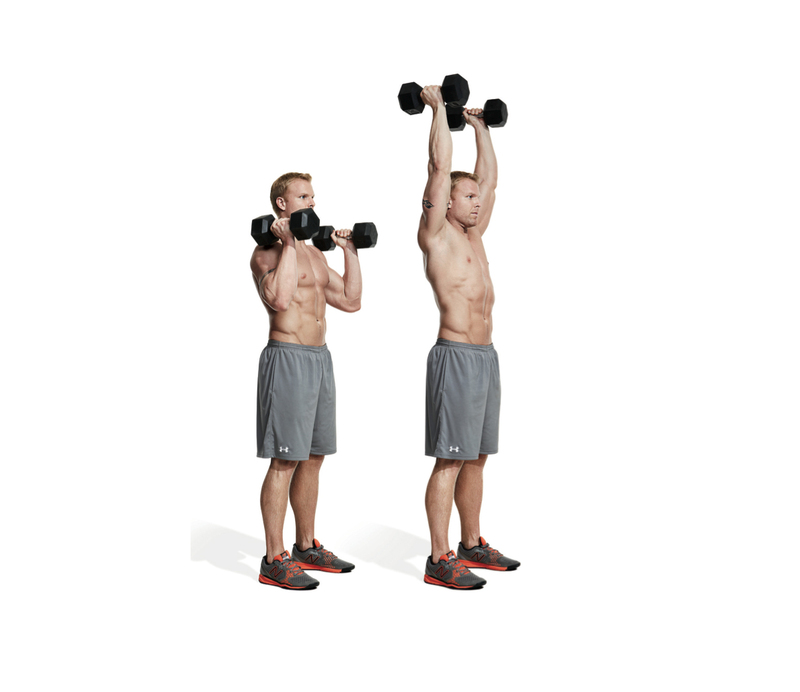 You can turn the dumbells round so that they are facing the front (as below), twist them round as and back as you do the movement or use a barbell to do the press. 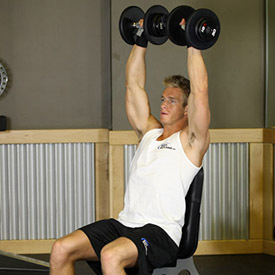 The shoulder press will make you look strong and is a perfect compliment to bodyweight exercises such as pull-ups. As an obstacle racer they also helped give you that assisted strength to pull and push yourself over barriers. Keep the pace steady and after doing a rep make sure to not go too far down. If you holding the weights at chest level you have gone too far.